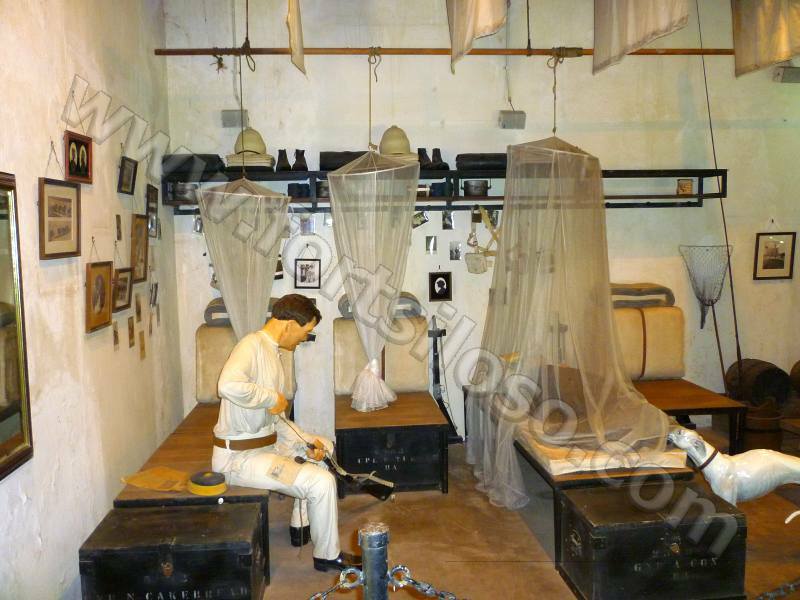 A soldier is sitting on his bed in this rather sparsely furnished room cleaning his Martini Henry Artillery Carbine. Pictures of home, many thousands of kilometres away adorn the wall by his bed. His personal belongings are kept in a wooden chest by his bed. Over the bed is a mosquito net, a rare sight in Singapore these days. In those days it was absolutely essential, as malaria was a real threat to health. 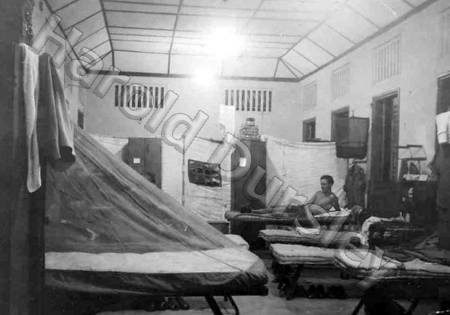 Another soldier is in bed with his mosquito net spread over his bed. A table and bench seats form the rest of the furniture. The room may be sparsely furnished, but in Victorian times, few working people had many comforts. Indeed, many soldiers of the day were better off than they would have been at home. They were guaranteed a roof over their heads, three meals a day, and pay - as poor as the pay was. The soldier’s, somewhat thin mattress is neatly rolled, secured and placed at the head of his bed. Notice that the bed is unsprung, just boards, and not at all like most people today have. There is not much space between beds either. His blankets and sheets are folded and placed on top of the mattress. This was called ‘boxing’ your blankets. Boxing blankets was still prevalent in the British Army when I joined many years ago, although we did not have to fold our mattresses. In the photo at the top, be seen ‘punkahs’. These were oblong pieces of fabric which were the forerunner of the electric fan. The fabric, fixed at the top, was flapped to-and-fro by a piece of rope, pulled by a servant or ‘Bearer’ (an Indian Army term), thus creating a cooling draught. Two barrack blocks on Blakang Mati. These were built in the 1930s to house the soldiers for the new defences. They are of similar design to many other barrack blocks which were built in Singapore to house military personnel following the implementation of General Gillman’s plans for coastal artillery and the building of the RAF Station at Seletar. The two buildings still stand, but have been converted in to a hotel, Le Méridien Hotel. The location is by the Merlion. Changed days indeed. LEFT: Harold Dursley lived in this billet during his posting to Fort Siloso from 1947 to 1948. The NCOs were accommodated behind the screen. He says that, “My bed was next to the lad on his bed.” Notice the sparseness of the furnishing and the lack of ceiling fans. 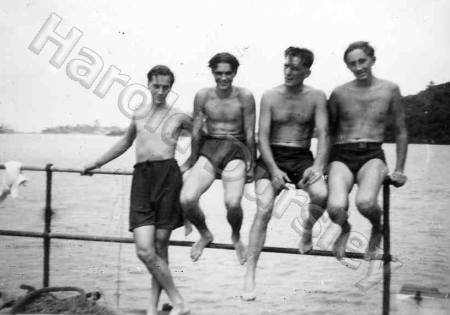 RIGHT: Harold (2nd left) with friends on Siloso Pier. 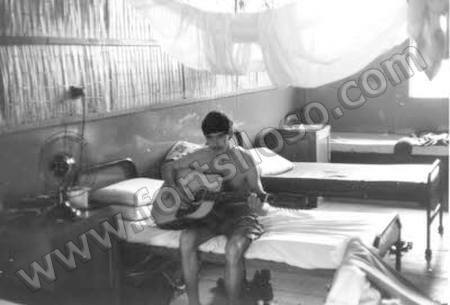 LEFT:A soldier plays his guitar in his attap (Nipa Palm) billet in August 1966. The photograph was taken in Kuching, Sarawak, during the Confrontation with Indonesia. Furnishing is sparse, but there is a table and chairs out of camera shot. The punkah has long gone, replaced by an electric fan in his side locker. 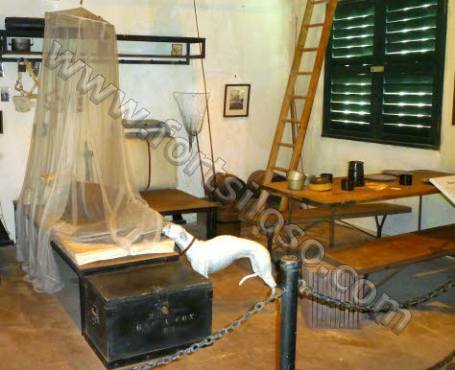 Above his bed is a mosquito net, still very necessary in Kuching then. These billets were not permanent accommodation, as the units using them were rotated from Singapore every few months. Despite the sparse accommodation, things had changed since the 1890s. Sanitation, food, the quality of the bed and bedding and recreation facilities had improved greatly. RIGHT: The guitar-picker in Barrack Block 139, RAF Changi during 1967. He has a large locker in which he can hang clothes as well as a smaller bedside locker which cannot be seen in the photograph. His steel parachute helmet, haversack and mess-tins are on top of the locker. Up to twelve men would share such a room. No air-conditioning, but at least there were ceiling mounted fans. A reading light was situated above every bed. One can just be seen on the right of the photograph. 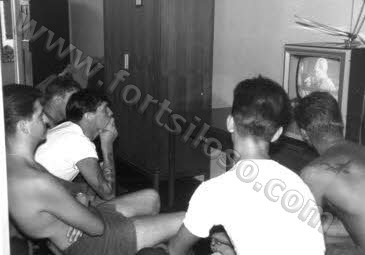 LEFT:Men of 55 Air Despatch Sqn RCT at RAF Changi, passing the time watching TV, circa 1967. As can be seen, comfortable chairs were not readily available in barrack rooms. Another pastime was playing cards with a little illicit gambling taking place. 'Egyptian PT' (lazily lying on your bed) was also quite popular. 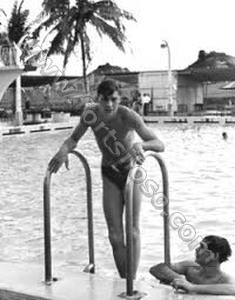 RIGHT: The webmaster at Seletar Pool in early 1966. The swimming pools at the various military camps were always popular. 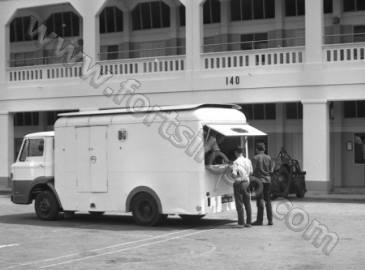 LEFT: A NAAFI wagon (van) outside Block 140 at Changi. Canteen and refreshment facilities were readily available on armed forces camps from the NAAFI (Navy, Army and Air force Institute), and Malcolm Club (RAF Stations only). Many men preferred to go to the local villages or into Singapore City where the bars and makan (food) stalls did good trade. Block 139 and 140 at RAF Changi were among those built during the 1930s, for Roberts Barracks. Block 139 was originally designated as ‘Q’ and Block 140 was ‘R’. Men of the Royal Artillery were the main residents of Roberts Barracks. Next to Roberts, was Kitchener Barracks, built for the Royal Engineers and other units. Most of the buildings were demolished in 2004. Block 151 which houses the Changi Murals was spared.